FOREWORD BY STEVEN SPIELBERG! 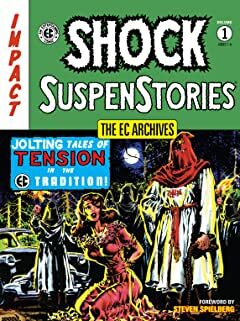 This beautiful hardcover reprints the first six complete issues of the pulp- comic classic Shock SuspenStories! Featuring the titanic artistic talents of Al Feldstein, Jack Kamen, Jack Davis, Joe Orlando, Graham Ingels, and Wally Wood, with a foreword by Steven Spielberg! Collects issues #1-#6 in full color! Foreword from MIND MGMT's Matt Kindt! Classic chronicles of criminals and capers! 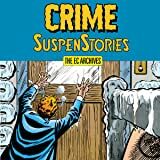 Collecting issues #7-#12 of Crime SuspenStories from the immortal artistic talents of Al Feldstein, Johnny Craig, Jack Kamen, Jack Davis, Graham Ingels, and George Roussos, this archive also features a foreword by Matt Kindt (MIND MGMT)! Fright fans, beware! 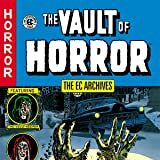 This hotly anticipated second volume, collecting EC Comics classic The Haunt of Fear #7-#12, is sure to chill you to the core! 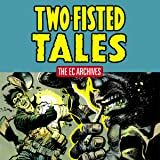 Featuring art from the celebrated talents of Johnny Craig, Graham Ingels, Jack Davis, Jack Kamen, George Roussos, Ed Smalle, and Joe Orlando! Dark Horse reprints the infamous comic series! Includes all the original ads, text pieces, and letters!